Concerned the grands don’t get enough exposure to wildlife, I announce we would be looking for armadillos on a recent road trip. They look at me like I am out of my mind. I might as well have said that I was going to grow a third ear. Each and every armadillo has been incapacitated. I search armadillos on my phone and see that they are also called “hillbilly speedbumps.” Great. I’ve been encouraging the grands to scout roadkill. Maybe seeing a few pictures of armadillos upright will provide a distraction. “Look, I have a picture of an armadillo on my phone,” I say. I used to believe a baby bat was the ugliest creature in the world—a face only a mother could love. 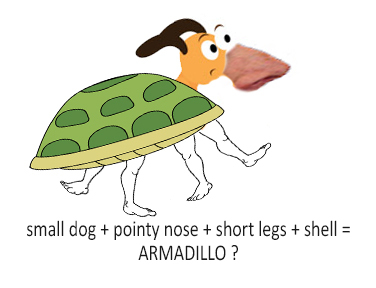 Armadillos with bad chin hair outrank them. Picture a baby bunny with long curled toenails in dire need of a pedicure. Add a slab of raw pork ribs to its back and you have a pink fairy armadillo. Silence. The skepticism that was once malleable has now hardened. The next morning, we’re cutting through a large city, cruising along four lanes of interstate with heavy traffic, when I spot a wild turkey emerge from underbrush and begin strutting on the shoulder of the road. My claim is met with palpable doubt.